Roman temples, while related to the Greek temple form in general design and use of the orders, represent a separate category of temple form. For example: Romans temples were built on an elevated plateau with a front staircase while the Greek temples were on a on a base of three steps (a stylobate). The Romans also added two new orders to Roman temple architecture: the Tuscan and Composite orders. 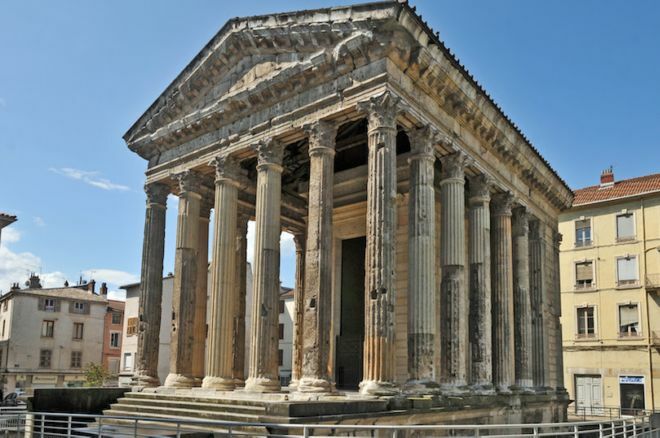 The Temple of Augustus and Livia, built at the end of the 1st century BC, survives today basically intact in the city of Vienne, France. Closely similar to the famous Roman temple Maison Carrée in Nîmes, the temple in Vienne was originally dedicated to Augustus. In 41 AD the ancient Roman temple was rededicated to his wife Livia in by her grandson Claudius, the Roman emperor who was born in nearby Lyon. Aizanoi, has been inhabited since 3000 BC, and grew wealthy under the Roman Empire through production of wool, grain, and wine. 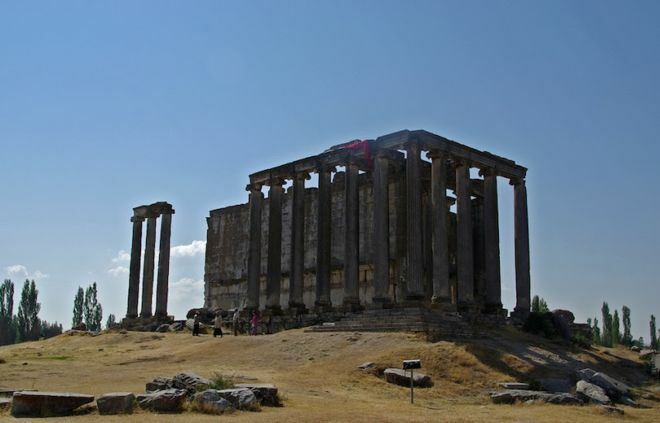 Aizanoi’s most impressive structure, the Temple of Zeus is the best-preserved Roman temple in all of Anatolia and was built in the 2nd century AD. The money needed for the temple’s construction was met by renting out land around the temple. However, the boundaries of the temple lands were unclear, and those who worked them refused to pay the taxes Emperor Hadrian settled the dispute and copies of the letters which were of such significance for the city were later inscribed on the temple walls. 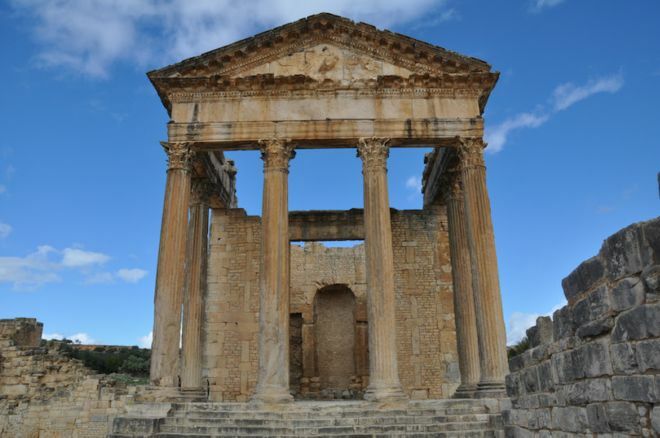 Located in northern Tunisia, Dougga is sometimes called “the best-preserved Roman small town in North Africa”. Amongst the most famous monuments at the site are a Punic-Libyan mausoleum, the theatre and the capitol. The capitol is a Roman temple from the 2nd century CE, principally dedicated to the three most important Roman gods: Jupiter, Juno and Minerva. It has a secondary dedication to the well-being of the emperors Lucius Verus and Marcus Aurelius. Dedicated to Helios, the Roman god of the sun, the Garni temple in Armenia was built by the Armenian King Trdates I in the 1st century AD. 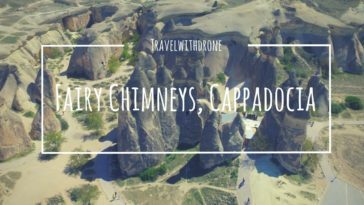 The construction was probably funded with money the king received from the Roman Emperor Nero in exchange for military support against the Parthian empire. 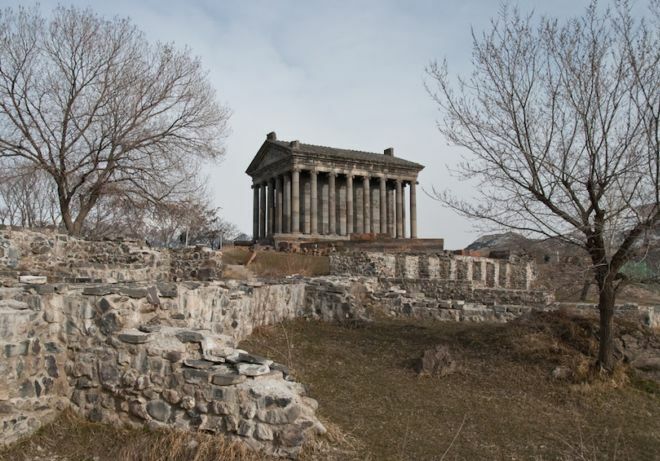 The Garni Temple contains 24 Ionic columns resting on a elevated podium and unlike other Greco-Roman temples, it is made of basalt. In 1679 an earthquake completely destroyed the ancient Roman temple and it lay in ruins until its reconstruction in the 1970s.